Hi guys! It's Andrea, here! As many of you know, I've done a lot of moving in the past several years. My husband and I have been married for seven years, and we are currently living in our seventh place together! Gosh, that sounds tiring doesn't it?! Anyway, in my experience, one of the hardest parts about moving into a new place is figuring out where and how to hang all of your artwork and pictures on the walls. It's intimidating from a design point of view, it's time consuming, and it always gives me a major headache. I've found though that the sooner you make yourself hang things up, the faster your house will feel like a home. 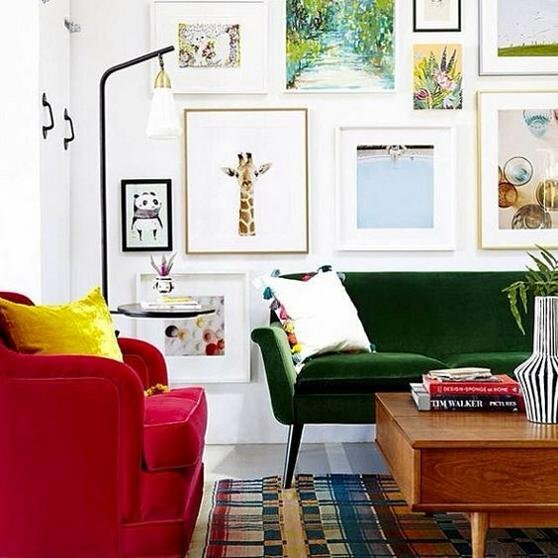 After all, artwork in a home is like frosting on a cake! It really is the most exciting, personal design element you've got. So make it count! 1. Always hang your artwork at 57" on center. One of the trickiest parts about displaying art is knowing exactly where to hang it on the wall. I learned in a design class once that most people are actually hanging artwork in their homes WAY too high. 57" might seem really low, but there is a science to it. 57" represents the average human eye level, and is regularly used as a standard in many art galleries and museums. 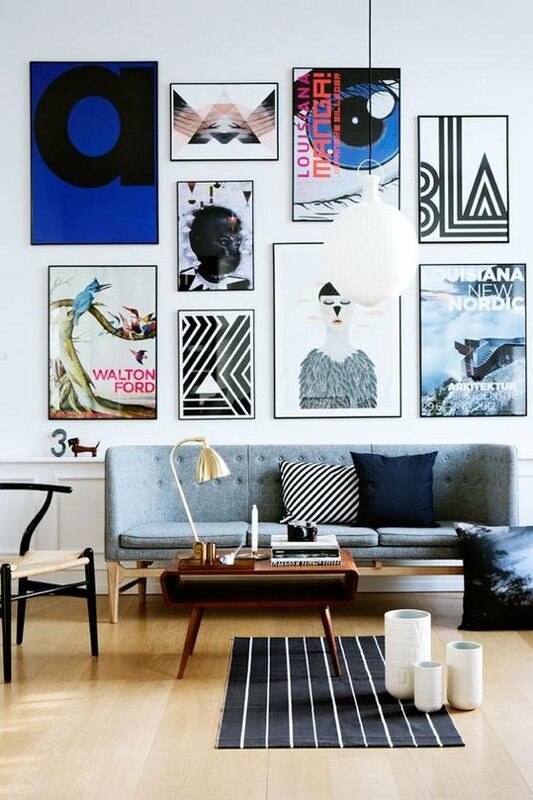 To do this in your home, just make sure the center point on your piece of art sits at 57" (measuring from the ground up) on the wall. This also applies to gallery walls (instead of having the center of one piece of work sit at 57" though, you will simply have the center point of the group sitting at 57"). 4. 10" - 2" = 8"
2. Curate a variety of images, sizes and shapes. 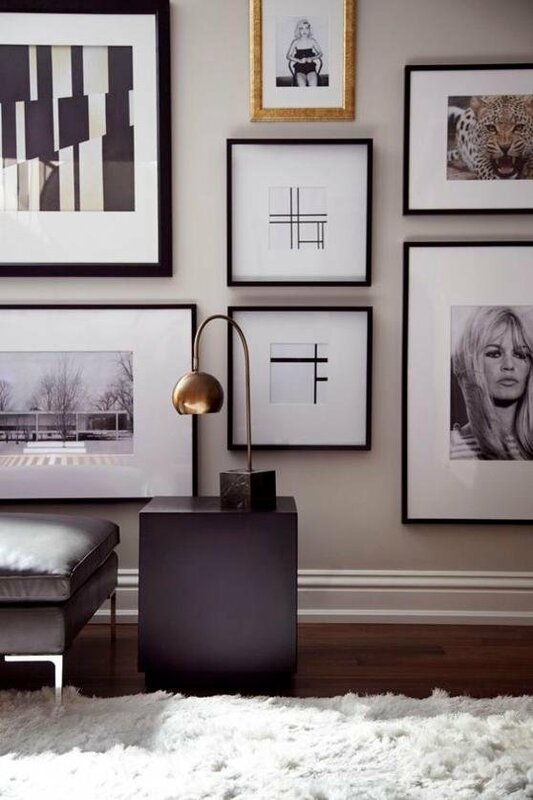 There is a time and place for uniformity, but the best gallery walls are visually pleasing because they employ many different sizes and shapes of artwork and frames. It's always a good idea to have at least one oversized piece that can serve as an anchor for smaller pictures. For better balance, it's been said to hang the larger pieces on the left. Don't be afraid of odd shapes- the weirder, the better! Also, stay away from too many little frames as it can make things start feeling messy and chaotic. 3. Stick with similar color palettes. Things can get really crazy with a gallery wall if you've got too many colors and finishes going on. 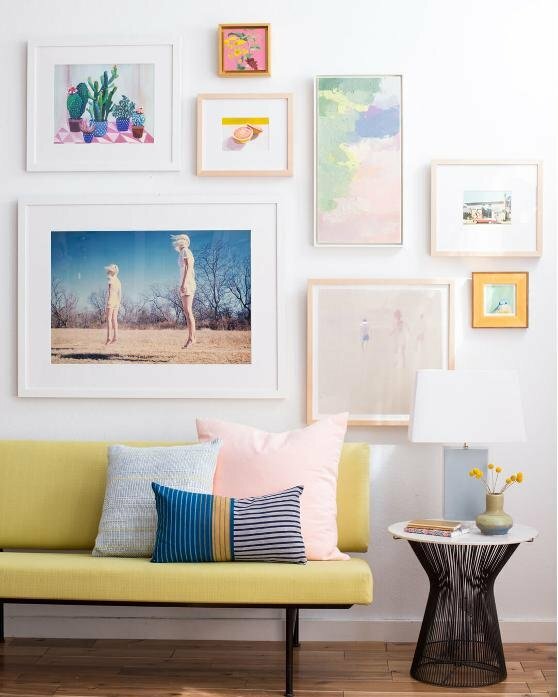 Little things like using matching colored mats, and sticking to a similar color palette with your frames can help to make your gallery wall look polished, and collected- not just thrown together haphazardly. Don't be afraid to have a pop of color here and there, but for the most part sticking to similar finishes and hues will keep things classy. 4. Keep at least 3" of space between frames. I'm not sure what makes this the magic number, but it just is. So stick to it and it will all work out. 5. Get everything laid out on the floor before you start pounding nails into the wall! I have made the mistake many times of just "going for it" with my gallery walls, and every single time I end up with a lot of holes in my wall! Try to resist the urge to figure it out as you go. Instead, lay everything out on the floor before you even think about locating your hammer. I like to get creative and always try a few different formations with my frames. Once I finish a grouping I stand above it and take a picture before moving onto the next one. In the end, comparing photos always helps me determine the very best grouping to go with. If you still need more reassurance, you can make templates of your frames with paper and actually tape them up on the wall where you want to hang them just to make sure it's what you want. 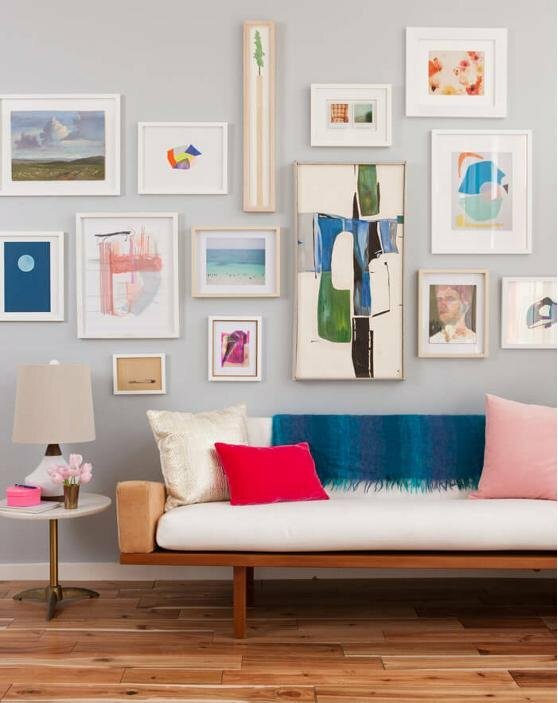 What tips have you found helpful when hanging artwork in your home?